Pocket Diapers are a complete cloth diapering system. Though very much like an All In One Cloth Diaper (AIO), pocket diapers are made up of three completely different layers. The waterproof outer material is sewn to an inner "Stay Dry" material; together those two layers form a pocket that is stuffed with the third layer, an absorbent pocket diaper insert. When using a pocket diaper, you do not have to worry about cloth diaper folding or how to choose a diaper cover; all the elements you will need are in one single diapering system. 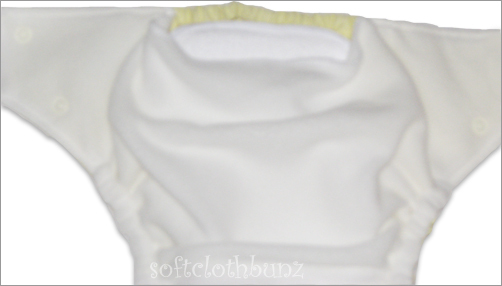 The pocket diaper used in the photo diagrams below is the Fuzzi Bunz Pocket Diaper. However, the same usage applies unversally to all our pocket diapers. The Fuzzi Bunz Pocket Diaper, although a cloth diaper, is quickly gaining mainstream attention for its ease of use, efficient design and stay dry effect that leaves baby's skin dry to the touch and therefore, rash free. Pocket diapers are a cinch to put on your baby. This step-by-step example will help you understand how easy it is to switch from disposables to cloth diapers. Pocket Diapers like Fuzzi Bunz allow you to continue cloth diapering your baby even when there are other caregivers around because they go on as easy as a disposable diaper. Pocket Diapers go on baby with the ease of a disposable diaper! 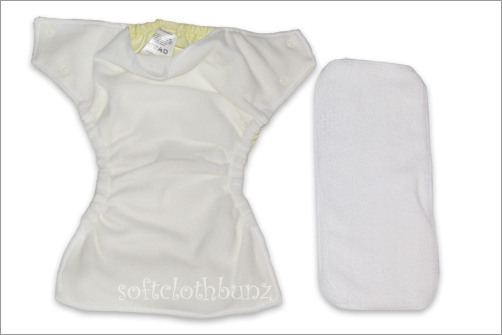 Below is one (1) Fuzzi Bunz pocket diaper and one (1) microber terry insert, layed-out and ready to stuff. 1. Slide the absorbent insert into the pocket opening found on the back, upper portion of the pocket diaper. 2. Pulling with your hand, move the absorbent insert down into the body of the pocket diaper until it reaches the front end. The insert should be long enough to go from one edge of the pocket diaper to the other edge without any additional length hanging out; this ensures maximum absorption without leakage. 3. 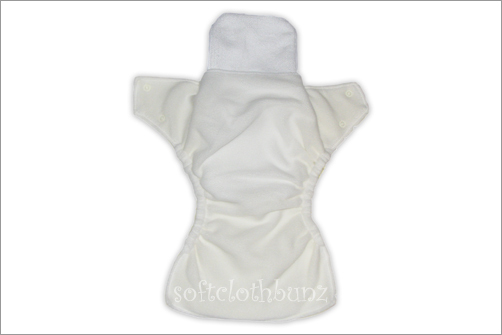 With the stuffed pocket diaper layed-out flat (wings or tabs stretching out to the left and right), place baby atop the open Fuzzi Bunz with the back edge of the pocket diaper level with the lower curve in baby's back and the front part of the cloth diaper up through the legs pressed up to the front waistline. 4. Grabbing one of the wings from the left or right, pull it around baby's side and find a secure snap setting on the front panel. 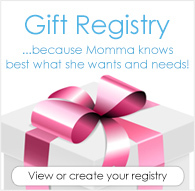 The snap setting placement lends a large variation for a more customized fit on your baby. 5. At times you may need to loosen or tighten the wings of a pocket diaper to get a comfortable fit on baby. If your baby is of sitting age, remember to allow a bit of "give" for when he/she is in he sitting position. We find that parents have a tendency to tighten too much in an attempt to reduce leakage. This will cause red marks to appear at your baby's waist and thigh and make it difficult for baby to move about comfortably. 6. Grab the wing from the other side and repeat the process again , snapping the wing to the front panel on the other side. 7. Adjustments are needed to ensure a good fit. Most of the time you will need to unsnap and adjust the wings for a more custom fit on your baby. See, I told you cloth diapering with pocket diapers is simple! Parents are always surprised when we are able to give demonstrations. It is always assumed that cloth diapering is difficult. As you can see from the steps above, it isn't. Pocket diapers like Fuzzi Bunz are a modern approach to cloth diapering that is quickly becoming mainstream for a very important reason; they work, they're cute and they are better for the environment than throwaway paper diapers (disposables). Now that you know how to put on a pocket diaper, you'll find that the same process is used with all in one cloth diapers and fitted diapers. The only difference is that fitted cloth diapers always require a diaper cover, as they do not have a waterproof outer fabric to keep in moisture. If you have any questions whatsoever, please get in touch with us, we'll be glad to help you find the right cloth diapering system for you and your baby.